The Art of Fine Gifts: Designed to make playing the guitar easy, this pack of chord cards encourages experimentation when learning and composing songs. Including an informative booklet and a handy reference card for common chord structures, the pack allows you to lay out, rearrange, and play around with the most popular chords. Each card features a guitar chord diagram, with links to the Flame Tree Music website where you can hear how each chord should sound. 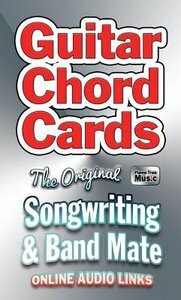 About "Guitar Chords Card (Pack)"